Current laws are not merely inadequate to protect workers at intelligence agencies, the report points out; they create a double bind. Executive Order 12674 requires employees to report “waste, fraud, abuse and corruption to the appropriate authorities” but whistleblower laws lack critical protections, including the following. No protection from criminal prosecution. The PEN report makes several criticisms of President Obama’s Presidential Policy Directive 19. PPD-19 [which I analyzed previously here and here]. PPD-19 tasks Inspectors General (IGs) with investigating whistleblower retaliation claims and recommending appropriate dispositions to agency heads. But, IG;s “lack neutrality and independence,” the report observes, and their recommendations to agency heads are not binding; moreover, “IG offices have been accused of destroying records, violating confidentiality, and failing to conduct adequate investigations.” The report identifies conflicts of interest in PPD-19, such as the directive’s requirement for agencies to establish their own implementing policies and procedures. The Intelligence Authorization Act for Fiscal Year 2014 codified portions of PPD-19, but even that offers “weak protections,” concludes the report, by prohibiting judicial reviews and “no explicit protection against criminal prosecution,” among other things. It would have been nice if the report had pointed out that many employees potentially covered by PPD-19 (because they hold security clearances) are not “intelligence community” employees. 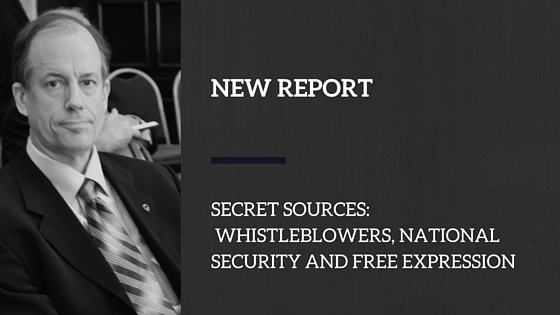 Even if their disclosures have nothing to do with classified information or programs, their clearances make them more vulnerable to reprisal than whistleblowers without clearances. Also, the report might have noted that agencies thus far have interpreted PPD-19 inconsistently in their implementing directives. That could pose problems for whistleblowers if the interpretations are later revised. Radack, a lawyer who represents Drake, commented, “I find it absolutely pathetic that the IG’s (Inspector General’s) Office or anyone is conflicted from being on the panel because Tom Drake is here, because there’s no litigation going on.” On Twitter, after the event, Drake responded that he was “disappointed” by Meyer’s decision.